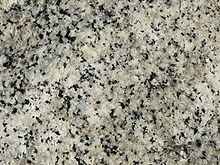 Close-up of granite, a phanerite rock, from Yosemite National Park in the U.S.
A phanerite is an igneous rock whose microstructure is made up of crystals large enough to be distinguished with the unaided eye. (In contrast, the crystals in an aphanitic rock are too small to be seen with the naked eye.) Phaneritic texture forms when magma deep underground in the plutonic environment cools slowly, giving the crystals time to grow. Phanerites are often described as coarse grained or macroscopically crystalline. ^ Monroe, James Stewart; Wicander, Reed; Hazlett, Richard W. (2007). "4". In Dodson, Keith. Physical Geology: Exploring the Earth. Earth Sciences (6 ed.). USA: Thompson Brooks/Cole. p. 115. ISBN 0495011487.